See below for additional pictures of Nightstands, Dressers, Chests of Drawers, Etc. Also, visit our manufacturer's website for an entire list of their sets including new collections: www.Artisanhomefurniture.com. 3 Drawer 2 Door Dresser Was $799 Disc. 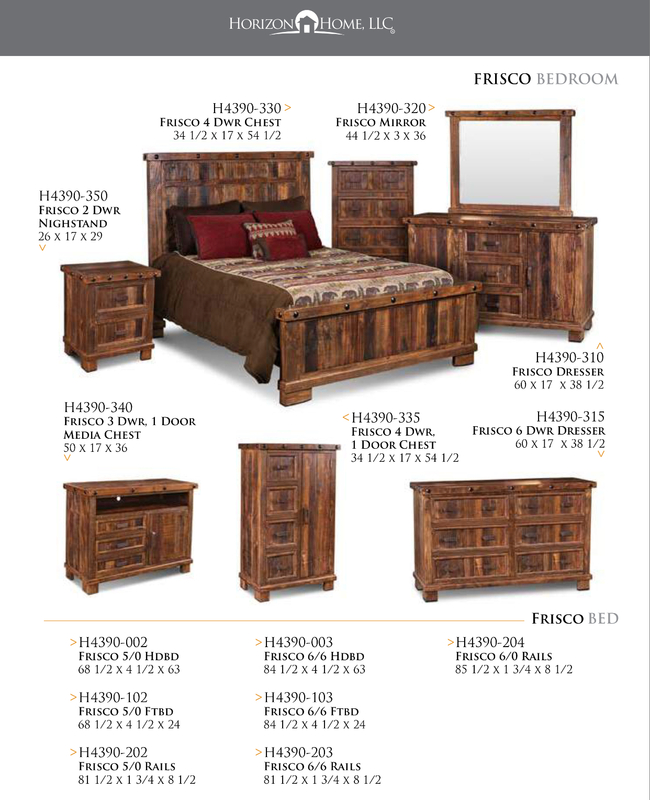 The Frisco Bedroom Set shown above by Horizon is still current but takes about 8 weeks to ship. Let us know if you needed pricing or eta estimates. *Dimensions are approximates. Please email or call a sales associate for package discount pricing and estimated ship times. All of our Multicolored furniture is 100% natural, and thus will have color variations. See our showroom in SLC for many of these pieces on display! This collection also features occasional tables, TV stands, and other pieces! 4 Drawer 1 Door Chest of Drawers Was $729 Disc. 4 Drawer Media Chest Was $729 Disc.